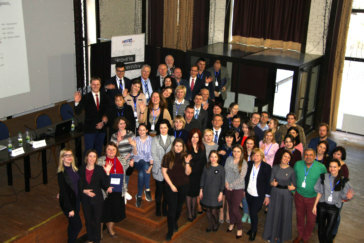 From 29-30 March around 60 alumni of our Civic School for Sound EU Practice (CiSEP) followed the invitation to take part in the interactive conference “Reforms! Changes! Really? Civil Power for Stronger Results” in Chernihiv, Ukraine. 1,5 years after the start of our CiSEP training series, the conference brought the civil society members together to discuss Ukraine’s EU association process and their role in it (in the past, present and future). A panel discussion with the heads of the Ukrainian National Platform of the Civil Society Forum, Hennadiy Maksak, and the Ukrainian Civil Society Platform (established by the Association Agreement), Zoriana Mishchuk, offered additional room for an exchange on the work of both platforms and the more general question of regional activism vs. centralised institutional decision making. While both platforms have a large member base from all over Ukraine and access to national and EU institutions, both panelists mentioned the problem of lack of member activity, while the audience in return criticised the perceived lack of transparency and openness to input from the regions. As the Civil Society Platform is still in the process of institutionalisation (it was established only a year ago) and the discussion on the distinct differences and responsibilities of both platforms is ongoing, these discussions will presumably remain a while longer. The public panel discussion that finalised the conference started with a key note speech by Mr Wolfgang Bindseil, Deputy Head of the German Embassy in Kyiv, on Germany’s role as a partner in Ukraine’s association process. He emphasised not only the increased trade between Germany and Ukraine, but also Germany’s involvement in the decentralisation and public administration reforms, energy efficiency measures, modernisation of the electricity grid, support for IDPs (internally displaced persons) and the financial support for infrastructure measures. For the following panel discussion on the general reform process in Ukraine Mr Bindseil was joined by Ms Iryna Bekeshkina, director of the Ilko Kucheriv Democratic Initiatives Foundation and Ms Olga Stefanishyna, director of the Government Office for European Integration. The panelists provided a broad overview of successes, risks and chances of and for the association process, emphasised the need for continuous reforms and the necessity of an active and informed civil society’s participation in this process. A report of the event (in Ukrainian) by Telekanal Novii Chernihiv can be found here.